A happy accident, this soup came about as I had some leftover green beans and kale in the fridge and I had intended to turn them into soup, so I bought a few extras to fling in alongside it. However, half way through making the soup, I took the beans and kale out the fridge only to discover that they looked rather worse for wear. The only place they were going would be the compost heap. However, all was not lost. With the addition of some frozen petit pois and a pinch of chilli flakes, I flung the soup in the blender and hoped for the best. 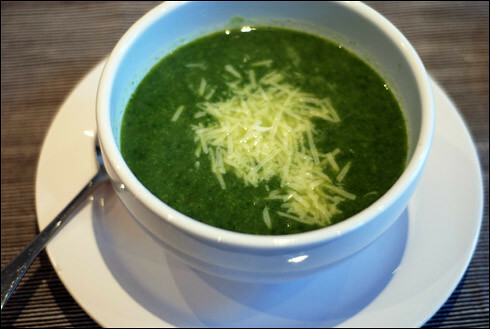 The result is delicious - a vibrant green, healthy soup with a faint kick from the chilli and spices. It's especially delicious with a sprinkle of parmesan on top. Bring the vegetable stock to the boil in a large pan. While the stock is heating up, chop the broccoli stem into 1cm chunks, and then pull apart the florets at the top. Once the stock is boiling, add the broccoli stems and simmer for 5 minutes before adding the florets. While the broccoli is cooking, gently fry the chopped onion and garlic over a low heat until the onion is translucent. After adding the florets to the stock, simmer for a further 5 minutes or until the florets are just soft, then add the spinach, petit pois, onion and garlic. Simmer for a further minute before transferring in batches to the blender. Don't blend it too much - you want the soup to have a slightly rustic texture. This is best eaten when really fresh or it'll lose its vibrancy. Serve with warm crusty bread and a sprinkle of parmesan. Very clever and pretty to look at!